Home » Business » Person of the Year, huh? Person of the Year, huh? One of the issues I will be writing the most about is on the economy and financial markets, of which I have been a passionate observer/participant for nearly two decades. 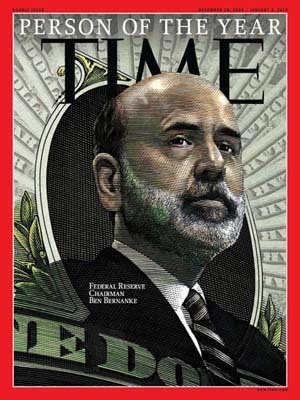 The issue now is Time Magazine’s selection of Bernanke as the “Person of the Year” for 2009 has raised a lot of eyebrows. Since Time has a history of selecting people who have done considerable damage to the world (like Hitler) as their “Person of the Year,” I argue that the choice may not be a bad choice after all. In the Greenspaan’s Fed, Bernanke has actively contributed to engineer policies that precipitated boom-and-bust cycles. His latest folly is to further empower Wall Street mafia to get rich at the expense of the tax payers, while the rest of the public pays for reckless and criminal behavior of major banks and Wall Street firms. Time wants us to believe that Bernanke saved us from a complete melt-down, but I think time will tell us a completely different story: Bernanke’s cure is worse than the disease that was ignored even caused/spread by Greenspan’s Fed.